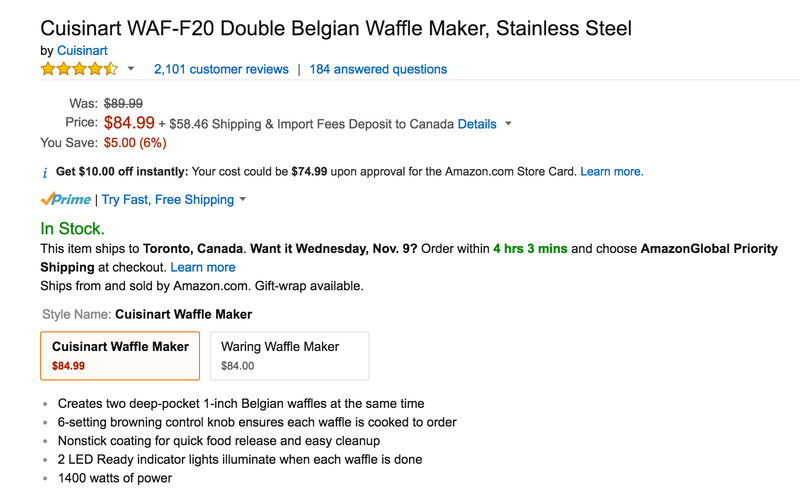 Amazon is offering the Cuisinart Double Belgian Waffle Maker in Stainless Steel (WAF-F20) for $84.99 shipped. It regularly sells for between $92 and $100 at trusted retailers and this is the lowest Amazon has offered it for. Rated 4+ stars from over 2,000 customers. If that sounds a bit overboard for you, give this Waring Pro maker for $38 shipped (Reg. up to $60+) a look. The Cuisinart Double Belgian Waffle Maker expertly bakes two 1-inch extra-deep, restaurant-style waffles at the same time. Just add syrup or fruit and enjoy a luxurious breakfast or special dessert right at home! The easy-to-handle rotary feature flips each waffle 180 degrees to ensure even cooking on top and bottom. A 6-setting browning control knob ensures both waffles are cooked to order, from light and fluffy to crisp and brown. LED lights and audio beep tones indicate when unit is ready to cook and when waffles are done. And the nonstick coating wipes clean, providing no mess and easy cleanup, plus effortless food release. It’s the perfect gift or perfect addition to any kitchen!